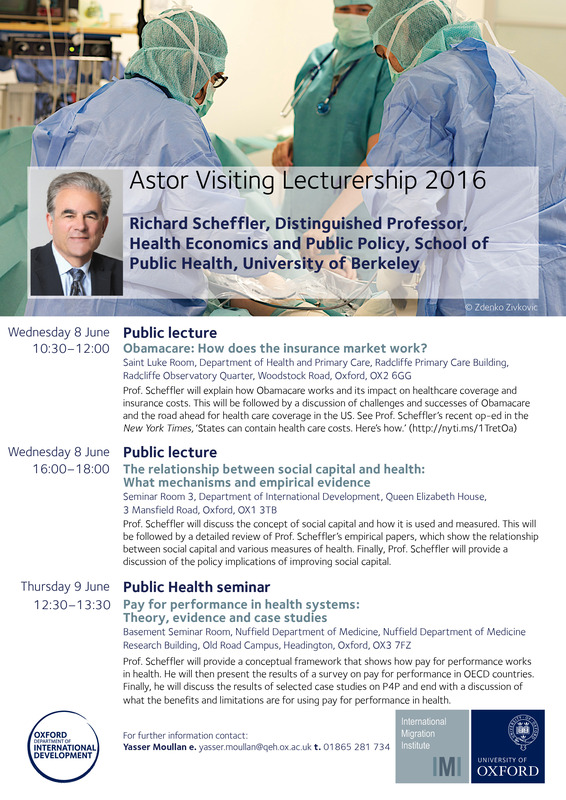 As part of his Astor Visiting Lectureship, Professor Richard Scheffler will give a public lecture on the relationship between social capital and health. He will begin by discussing the concept of social capital and how it is used and measured. This will be followed by a detailed review of Professor Scheffler’s empirical papers, which show the relationship between social capital and various measures of health. Finally, Professor Scheffler will provide a discussion of the policy implications of improving social capital. Richard M. Scheffler is Distinguished Professor of Health Economics and Public Policy at the School of Public Health and the Goldman School of Public Policy at the University of California, Berkeley. He also holds the chair in Healthcare Markets & Consumer Welfare endowed by the Office of the Attorney General for the State of California. Professor Scheffler is director of The Global Center for Health Economics and Policy Research as well as director of The Nicholas C. Petris Center on Health Care Markets and Consumer Welfare. He has been a Rockefeller and a Fulbright Scholar, and served as president of the International Health Economists Association 4th Congress in 2004. Professor Scheffler has published about 200 papers and edited and written twelve books, including his most recent book, The ADHD Explosion: Myths, Medication, Money and Today's Push for Performance with Stephen Hinshaw, published by Oxford Press in March 2014. He has conducted a recent review on Pay for Performance in Health for the World Health Organization and the OECD. Professor Scheffler was awarded the Fulbright Scholarship at Pontifica Universidad Católica de Chile in in Santiago, Chile as well as the Chair of Excellence Award at the Carlos III University of Madrid in Madrid, Spain in 2012 through 2013. He was just awarded the Gold Medal from Charles University in Prague, Czech Republic for his continued support of international scientific and educational collaboration in 2015. Professor Scheffler has just released a 3-volume World Scientific Handbook on Global Health Economics and Public Policy.